The first EKOS daily release is out, and while the Conservatives can be happy that they're ahead, the Liberals can rejoice that they are up 4 points in a week and have erased their deficit in ON. 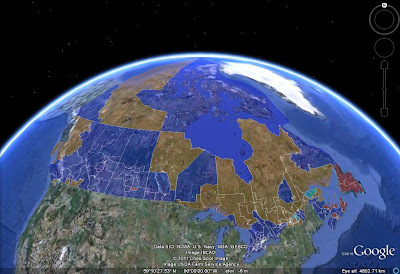 It's all bad news for the NDP: 22.2% nationally, tied with Tories at 27.8% in Québec, and a paltry 16.8% in ON. 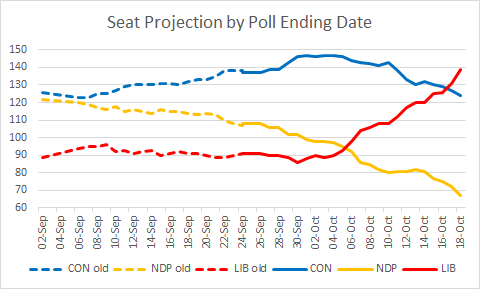 Note that I unfroze the AB projection since EKOS has confirmed the Conservative surge and NDP collapse there. 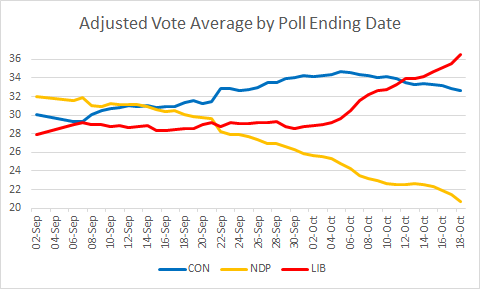 However, I am still waiting for more evidence before making the Edmonton adjustment suggested by yesterday's Mainstreet poll. Note that I will now be updating the projection twice (and only twice) daily: when I wake up (keep in mind that I live on the West Coast), and after EKOS releases its daily poll. Also, look for a preliminary guide to strategic voting Thursday night - just in time for the advanced voting. What exactly is a 'turnout adjustment' ?